Oat milk has emerged as a lactose-free, vegan alternative to cow's and goat's milk. High in protein and low in fat, it provides both flavor and nutrition. Many brands are enriched with calcium and vitamin D, which further increases their nutritional value. Plus, you can always make your own milk at home to cut costs and have full control over the ingredients used. Low in calories and high in protein, oat milk promotes satiety and can bring you closer to your weight-loss goals. Plus, it's free of gluten, lactose, nuts, eggs and other common allergens. This healthful beverage when fortified is rich in vitamin D, iron, calcium, potassium and fiber. Its nutritional content depends on the ingredients used and varies from one brand to the next. If you make oat milk at home, you'll know exactly what's inside your cup, but may not get the vitamin D and calcium like you would from a store-bought brand. It also provides 25 percent of the RDA of calcium, 18 percent of the RDA of vitamin D and 11 percent of the RDA of potassium. It boasts 25 percent of the RDA of calcium, 5 percent of the RDA of vitamin A and 1 percent of the RDA of iron. Unlike oat milk, it has no fiber at all. At first sight, it seems like a better choice than oat milk. The problem is that it still contains lactose, which may cause adverse reactions in those who are allergic to it. Also, cow's milk is off-limits for vegans. Customers who prefer oat milk can choose from a wide range of flavors and varieties. Oatly products, for example, include whole oat milk, low-fat oat milk, organic and semi-organic oat milk, chocolate oat milk and more. Some varieties are specially designed for homemade desserts and other goodies. Oat milk contains no nuts, dairy or other common allergens, which is reason enough to give it a try. Plus, as a source of fiber, can fill you up quickly. Most Americans miss the mark when it comes to getting enough fiber in their diet. Adding oat milk to your rotation may help you get closer to your daily fiber needs. Fiber can help you slim down as well. According to a 2015 controlled trial published in the Annals of Internal Medicine, increasing your daily fiber intake may lead to weight loss. Other studies indicate a strong link between low-fiber diets and a high body mass index (BMI). Even though this nutrient doesn't directly influence your weight, it works in other ways. A high-fiber intake promotes satiety and improves appetite control, making it easier, in turn, to stick to your diet and downsize your portions. So, drinking oat milk between meals or whenever you're hungry may bring you closer to your weight-loss goals. Fortified oat milk also provides large amounts of calcium, keeping your bones strong. Calcium plays a key role in blood clotting, muscle and nerve function, cardiovascular health and bone development. When consumed in adequate doses, it may lower your risk of osteoporosis. Furthermore, you may prefer oat milk over soy milk, another popular milk-alternative beverage, if you have concerns about genetically modified organisms (GMOs). Approximately 94 percent of soy crops are genetically modified. Whether GMOs are harmful to human health is subject to debate. This type of nondairy milk is ideal for those who are allergic to milk and its derivates, nuts, gluten and other common ingredients. Oats are gluten-free, so they can be safely consumed by people with celiac disease. There are some things to consider, though. Oats are often processed in facilities that also handle wheat, rye, barley, nuts and other allergens, so there's a risk of cross-contamination. Additionally, they may still trigger allergic reactions in those suffering from celiac disease, even though this isn’t common. In a 2015 study published in the Journal of Autoimmunity, avenin-specific T cells were activated in 12 percent of celiac disease patients who consumed 100 grams of oats daily for three days. These cells are sensitive to gluten and can trigger allergic reactions when exposed to it. 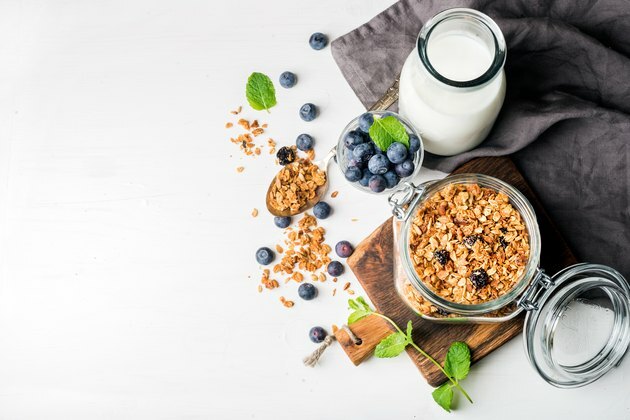 Subjects experienced digestive distress; however, researchers say that their symptoms weren’t necessarily related to T-cell activation, but rather to the large amount of oats consumed. These findings indicate that oats are likely safe for people with celiac disease. Just make sure you choose gluten-free oat milk. Some ingredients used in this beverage may be contaminated with gluten. Read the label to get the information you need. Another option is to make oat milk at home. All you need is water and oats. For extra flavor, add cinnamon, raw cocoa, vanilla essence, stevia and other natural ingredients. Beyond Celiac: Are Oats Gluten-Free?